According to the latest figures released by International Data Corporation's Quarterly Wearables Tracker, the Indian wearable market grew 66 per cent year-over-year (YOY) and 40 per cent sequentially, in the second quarter of 2018. Wearables are in great demand in the Indian market. 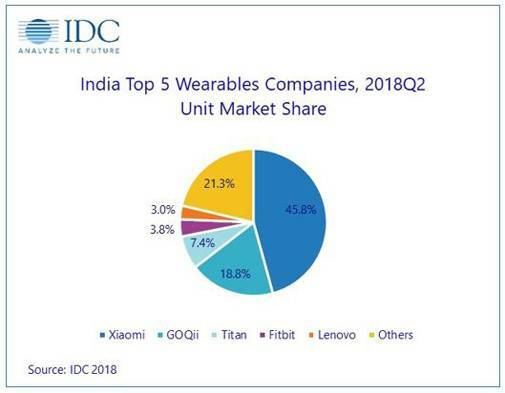 According to the latest figures released by IDC's (International Data Corporation) Quarterly Wearables Tracker, the Indian wearable market grew 66 per cent year-over-year (YOY) and 40 per cent sequentially, in the second quarter of 2018 (2018Q2). One million wearables were shipped in 2018Q2 with Xiaomi, Goqii and Titan retaining the first three spots in the overall wearables market. While wristbands accounted for almost 90 per cent of the shipments during the quarter, smartwatches with wearable computing grew 34 per cent sequentially. In smartwatches, Apple emerged as a clear leader, and one out of every three watches sold in India during the quarter, was an Apple Watch. After launching Apple Watch Series 3 in India late last year, the Cupertino giant launched Apple Watch Series 3 with Cellular in May this year. However, Apple is not amongst the top five wearable brands in the country. Navkendar Singh, Associate Research Director, IDC India, says, "Today, health is becoming a priority in urban India and consumers are opting for the fitness bands to monitor their routine, and are also comfortable to spend on fitness devices to have a healthy lifestyle. However, large numbers of users are still facing difficulties to see the real value from these devices in absence of any tangible benefits". He further adds, "Vendors need to develop services ecosystem around it to keep the users motivated and drive the repeat purchase". Xiaomi maintained the top spot in wearables with 45.8 per cent market share and registered a 31per cent quarter-over-quarter (QoQ) growth in the second quarter of 2018. With 18.8 per cent market share, Goqii continued to be at the second spot but due to its interactive ecosystem and live coaching, beyond activity monitoring has registered a 74 per cent annual growth and 36 per cent sequential growth. Titan with the help of its Fastrack's Reflex range grabbed the third position with a 7.4 per cent market share, while witnessing a 56 per cent sequential increase in its overall shipments. However, its shipments saw a 45 per cent decline in annual growth as it channelised its inventory before launching new devices to the market. Fitbit graduated to the 4th spot as its shipments quadrupled in Q218, in comparison to the previous quarter. Fitbit introduced the Versa watch, adding one more device in its watch portfolio. However, the Flex 2 contributed more than half to its overall shipments in this quarter. Lenovo launched three new models to strengthen its position in the fitness band category, which helped the brand to register a strong triple-digit growth in the last quarter. "After a relatively slow 2017, it looks like the market is finding its footing in 2018. Companies have increased their marketing spend, exploring alternate channels to sell their devices, and updating their platforms to increase the gamification and maximise the user engagement" says Jaipal Singh, Associate Research Manager, Client Devices, IDC India. New launches and affordable finance schemes in the channel contributed towards the growth of smartwatches. The report states that "this growth can be largely attributed to a precautionary measure against the expected implementation of national standard norms by the Bureau of Indian Standards (BIS) for the wearables category in the middle of 2018Q2. In anticipation of this, companies shipped high numbers of units before the BIS implementation in the country. Additionally, e-tailers brought in more shipments to meet the demand coming via various online shopping sales in June and July." Apart from the existing players, the market witnessed the entry of the new players from the fashion e-commerce, IOT and startups verticals this quarter.